Long ago Lord Brahma created three ‘manasputras’, namely Gaya, Lavana and Kolha. All the three were extremely powerful and became practically invincible after performing severe penance of Lord Shiva. Both Gaya and Lavana enraged Indra and Yama, and creeated lot of problems to Gods. Vishnu with the assistance of other gods killed both of them. However, the gods consented to turn the spots on which they had fallen into tirths, thus we have the Vishnugaya tirth. Kolha, the monarch of Kolhapur, and the youngest brother decided to seek revenge of the deaths but did not want to wage a war and create bloodshed instead wanted to dethrone Indra and other Gods from their positions with the power of his penance. Determined he went to Kolhagiri hills and followed a severe penance, days passed and so did his strength. Kolhasur soon received the blessings of Brahmadeva, and returned to his capital to see that it was over taken by a demon Sukeshi. Kolhasur attacked Sukeshi and slew him after a ferocious struggle. Kolhasur entrusted the administration to Karvir, his eldest son. His natural inclination towards aggression and bloodshed burst into flames of hatred when he learnt that the Deva’s were responsible for the death of his two uncle’s. He took upon himself the task of seeking revenge and started slaughtering sages and demolishing shrines. When the devotees rushed seeking refuge, Devas waged a war against Karvir the battle that ensued was severe. 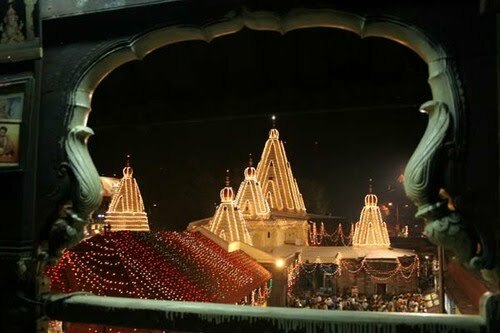 Karvir’s 3 brother’s lost their lives and Lord Shiva slew Karvir in the end and in accordance with a promise given to him before his death named the city ‘Karvirnagar’. 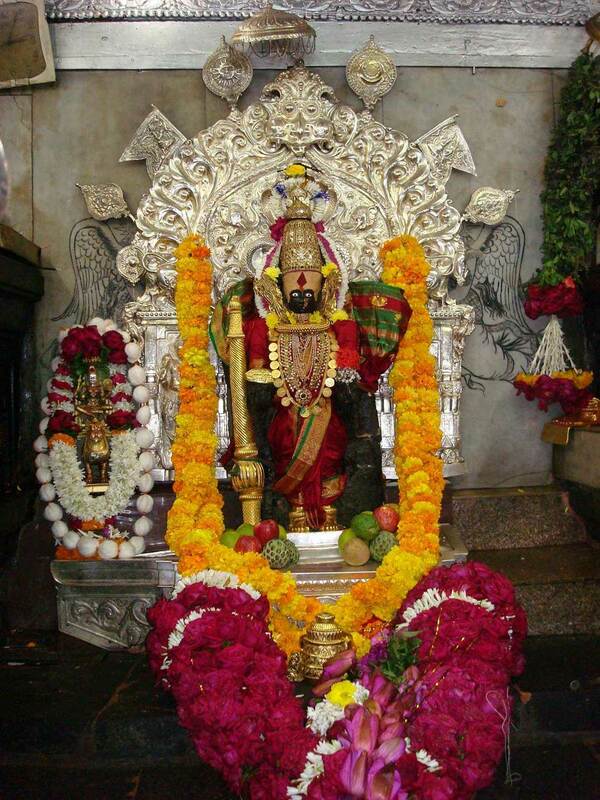 Distressed Deva’s approached the Trimurthi for rescue, who in turn adviced to seek relief through the Great Goddess. Devi, though was extremely angry from hearing accounts of the atrocities of Kolhasur, could do anything as she had granted the boon to him that she would stay away for a period of hundred years. As years rolled and the 100 year period was coming to an end, an angry Devi proceeded towards Kolhapur accompanied by a large army of Deva’s, amongst whom counted Ranka Bhairav, Kal-Vetal, Siddha-Batukeshvar and her Chamundi. Devi assumed an eighteen armed form, mounted on her lion and set against Kolhasur. Kolhasur though an Asura, had some good values in him and was repentant of his deeds. He prayed for forgiveness and when Devi offered him her blessings, he quickly asked for 3 boons. First the spot where he would die should become a “Thirth Sthala”. 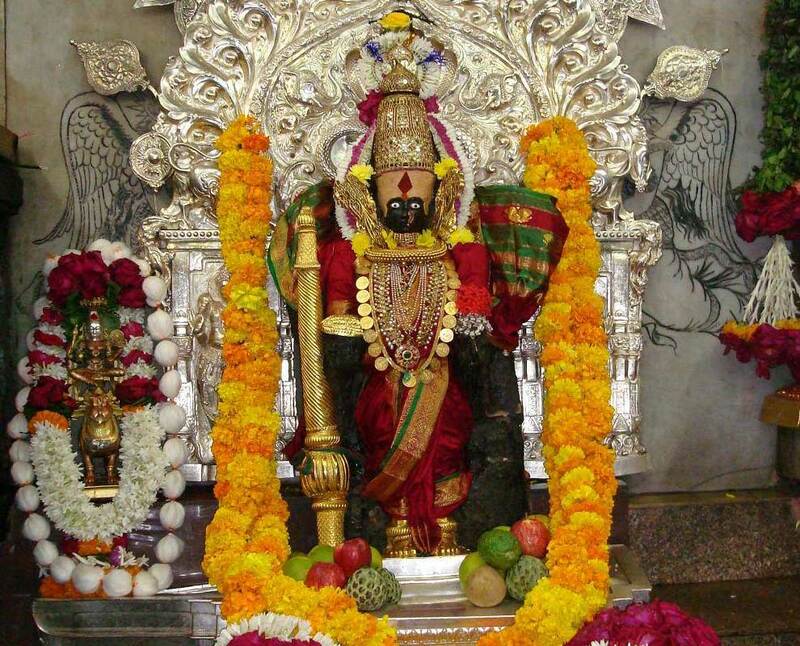 Second Devi should reside in her original abode as before and the place should be known as Kolhapur after him. Thirdly every year the fruit ‘Kohala’ should be cut ceremonially in his honour. Goddess pleased by his devotion said ‘tathastu’ and gave him ‘mukti,’ . 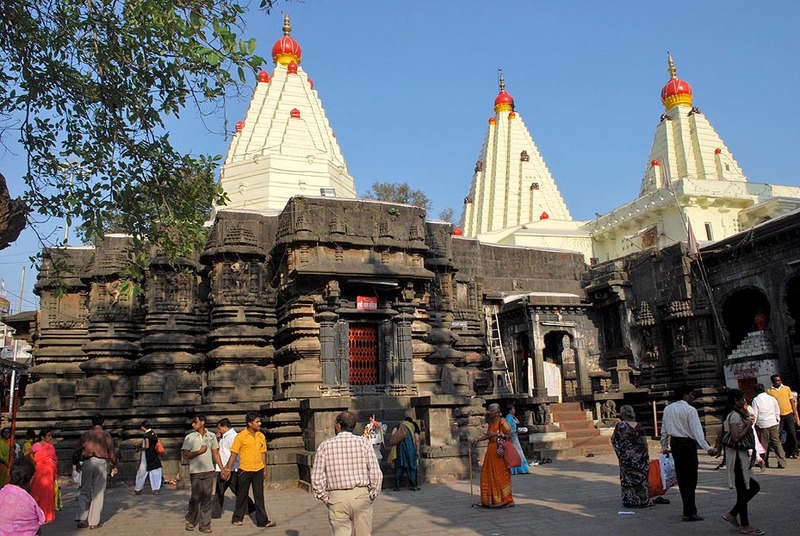 The temple dates back to Circa 600 to 700 A.D. constructed during Chalukya reign. Though the temple was built by the Chalukya ruler, Karandev, it was the Shilahara Yadava who extended and beautified it. The Mahadwara – main entrance of the temple is the in the west with lots of small shops selling items for worship of the Devi. Walking further down the Mahadwara one is confronted with several deepa maala’s on either side, then comes a large open hall of timber construction. 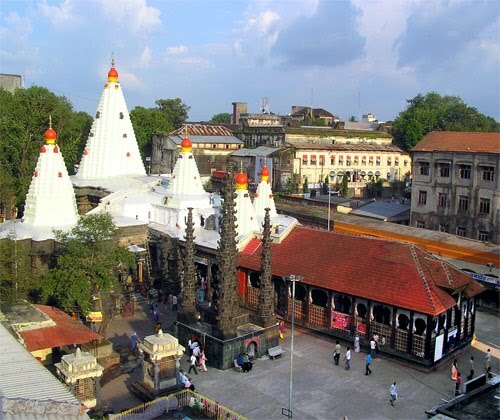 The huge square pillars and foliated arches in wood are characteristic of Maratha temple architecture. 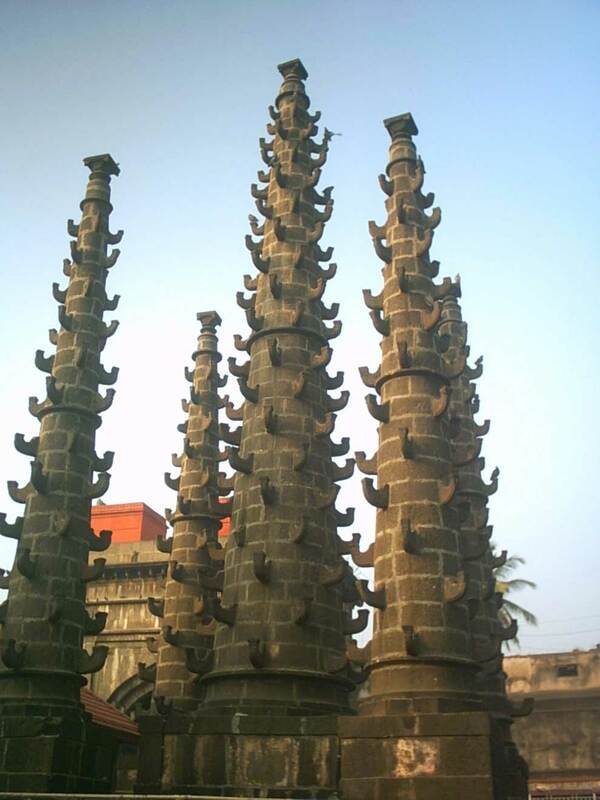 This Mandap is called as Garuda-mandap and was constructed during the eighteenth century. An image of Garuda, the vahana of Vishnu, is housed in this mandap so as to face the sanctum. Adjoining it towards the east is a small mandap of stone construction. It is built on a raised plinth. An image of Ganesh nearly four feet in height stands in the centre facing the sanctum. In the central shrine, facing the west, stands the Ambabai. The northern shrine is occupied by Mahakali, the southern by Mahasaraswati. Also seen in this temple is a rich display of sculpture of figurines in dancing poses, musicians, Gods and Goddesses. The three sancta have rather simple shikharas of brick and mortar dating back to the 19th century. An extremely unusual position is occupied by a Shiva ling. 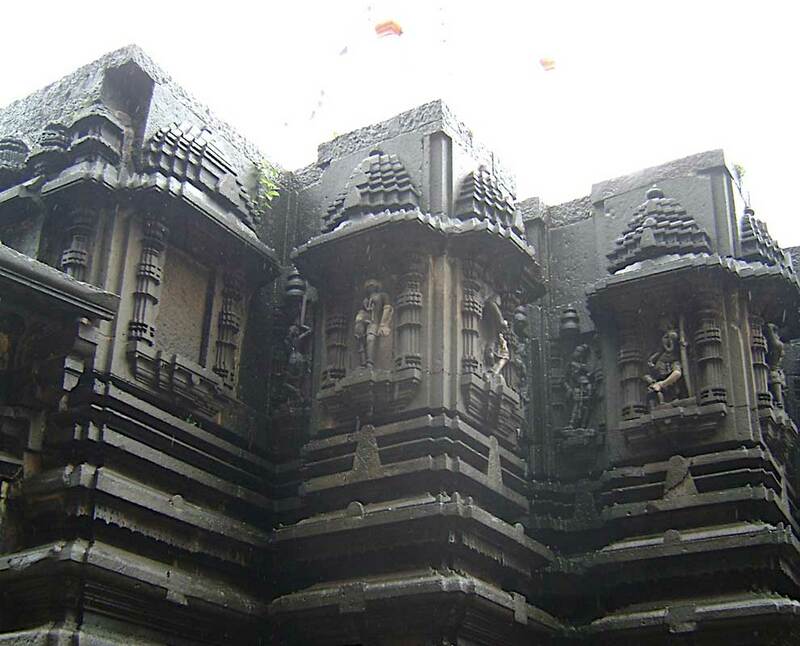 Immediately above the garbhagriha of the Mahalakshmi shrine is a second storey. Here a Shiva ling and a nandi are placed, it is still a mystery as to when and by whom it was placed. Unlike most Hindu sacred images, which face north or east, the image of this deity looks west (Pashchim). There is a small open window on the western wall, through which the setting sun rays falls on the face of the idol for three days around the 21st of each March and September. 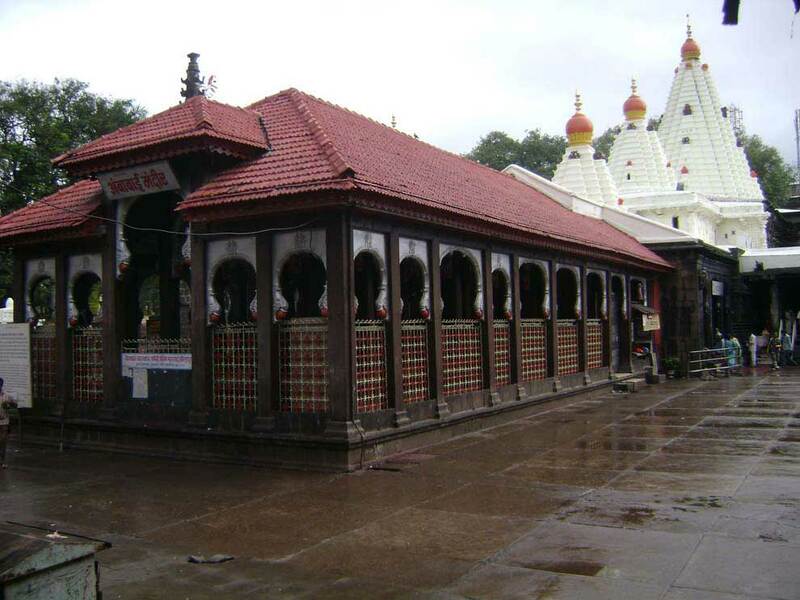 Shree Karveer Nivasini Mahalakshmi Temple, Kolhapur-416012, Maharashtra. Manager : Dhanaji Jadhav -254779. Tarabai Road, Kolhapur Maharashtra India. fantastic website but don't use images without permission of the image owner. use your own photographs.